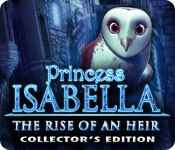 Princess Isabella: The Rise Of An Heir Collector's Edition is rated 3.5 out of 5 by 92. Rated 5 out of 5 by dollyflower from Beautiful to Look at, Fun to Play I enjoyed this game as much as the other two in the series, even tho it is easier, the art is beautiful and the music pretty and I really like the way the fairy and dragon helpers don't zoom in on every scene. For a relaxing game, this game can't be beat. You can seven set the speed of the hint and skip buttons! Rated 5 out of 5 by HOAdventureFan from A True Trilogy With a Happy and Satisfactory Conclusion!! I loved this series for the light, colorful, lighthearted storyline/plot! So many games these days are entirely too dark, "supposedly" sinister, and depressing! Games are meant to be fun (not a chore, not work, and not persistently dark and depressing!) Not that I would NEVER enjoy some of the darker games, but I like to have a good blend of both in my collection. I look for many things in a game that are deciding factors as to whether I will actually purchase the game, purchase the SE vs. the CE, and am likely to replay the games. This game had it all! Yes, I purchased this game. Yes, I will replay the game. And, well? the SE over the CE? I'm not certain that the bonus content makes the CE worth the extra money/credits. Basically, the princess is ridding her castle of "lasting remnants" of evil left by the witch. It's fun and okay, gives a plot addition where owl becomes a "master" of his powers and for his heritage (so that is good!) It lets you know that he and Bella will be able to continue the lineage of protection. I would give this game a full 5 star rating and would definitely recommend it for gamers who like to get away from the dark and dreary games/plots. It is a good game to add to your collection! If you have not already done so, it would be a good idea to go back and get the other 2 games in the series in order to have the full plot! Those games are also fun (although the first game will lack visual/technical quality that was improved with the last 2 - but that is okay, especially if you use a "free game" credit). Rated 5 out of 5 by blueskylife from An excellent game It is an excellent ending to a great series. I got the Collector's Edition. It was worth the money I spent. The colors were bright and beautiful. The music is excellent, you could here the same music from the first two games. But it not loud. Game play is good. I would recommend this game. Rated 5 out of 5 by camjacques from Loved the "Cute Roots" As I have played the two previous games a few times I was pleased to see at last the latest chapter in what has been for me a beautifully put together faerie story. In this, the final part of the triology the Witch has not only taken your Mother she has captured your three Faerie Godmothers as well. This time you have a third companion to help you, an owl called guess what "Owl" along with "Dragon" and "Faerie" to get to those awkward places. A couple of magic wands play a part as well. I found all but one of the puzzles incredibly easy. If you are like me and not too good in following "Simon Says" type patterns where you have to remember the order. Turn off the background music to concentrate. I ended up writing the order down on an envelope to get it. I use skip only if I cannot understand the Strategy Guide which I hardly used. I found it easier to press the hint button which pointed the direction you had to go. 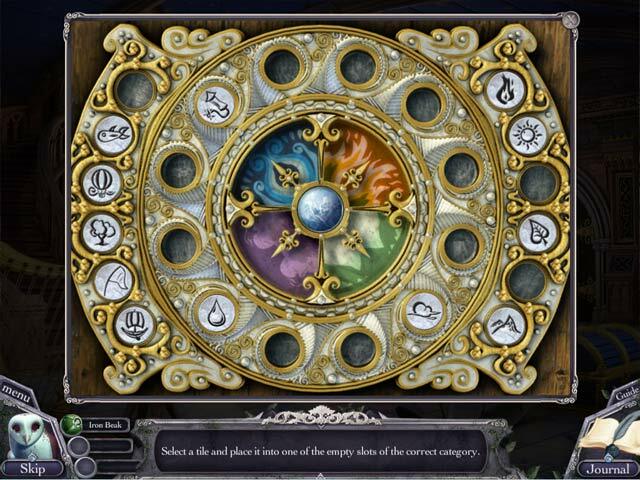 The hidden objects were bright some of them were repeated a few times. So once you knew what something looked like it was the same elsewhere. 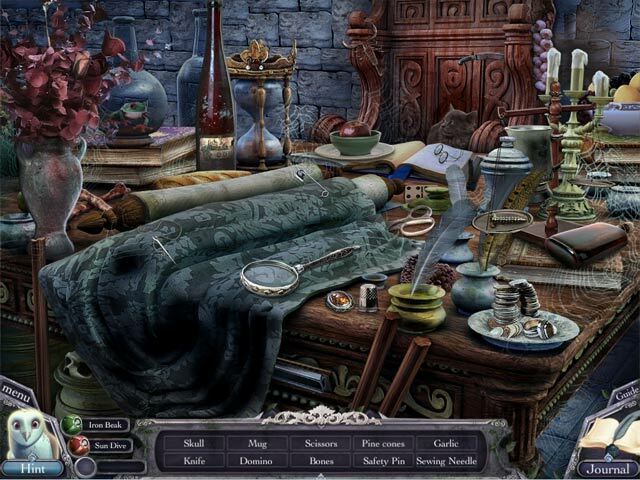 There were the usual skulls and for those who are scared of snakes don't go near this game it's full of them mostly ornamental. I recognised the evil objects were in previous games too. By the way the "Cute Roots" referred to in my title are the many mandrake roots one rescues that play a vital part towards the end of the game. I compare them to the ones in J K Rowling's Harry Potter and I must say I prefer these. They don't scream at you but say a very polite thank you and they are so sweet. Their eyebrows remind me of the "OompaLoompahs in Roald Dahl's Charlie and the Chocolate Factory. I bought the Collector's Edition because I like to have the extra chapter. 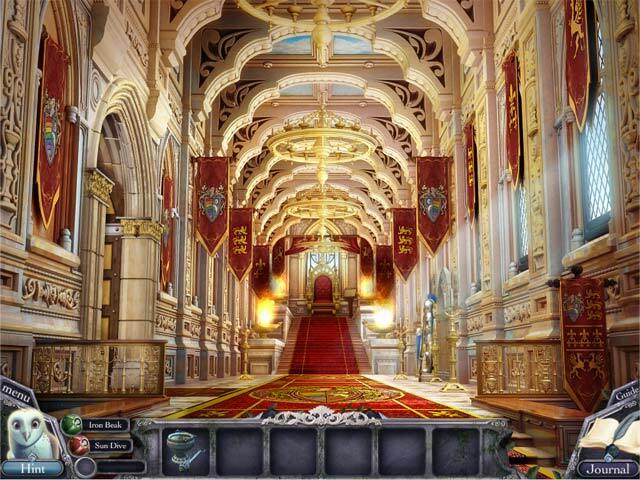 This chapter helps you to clear out the remaining evil parts of the Palace and free the spirits of Bella's grandparents the King and Queen and also the servants that you meet in the first two parts of this great triology. In the extras there is an intriguing look at the Gogii studios and a snapshot film of the actors playing the various characters. One of them has an amazing ginger moustache. I also like to see the artwork behind it all. There are also some beautiful screensavers. I am not sure if this will be the final story after all there was a suggestion that Owl and Bella will have many more adventures together in the future. Here's hoping and on that note I say goodbye. Rated 5 out of 5 by Jem_Jerrica_Guy from Worth the long wait! The wand that has magic powers and different powers in the bonus collector's edition story make Gogii advancing casual game technology. Ending is abrupt, wish we saw more of the parents. The graphics are not as detailed as Elephant games, but this art team has a specific style that went with the last chapter before.